Twice a year, the Blues enthrall local audiences with free, public air shows that include other military and civilian aeronautic teams. 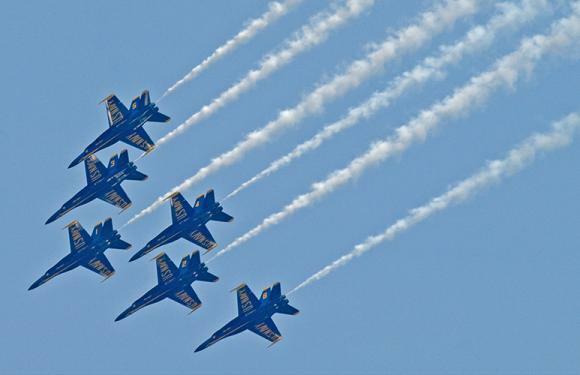 On July 14th, thousands of spectators are awed by the Pensacola Beach Air Show on Pensacola Beach where the Blue Angels perform aerial acrobatics over the Gulf of Mexico. In November, they close their season with a homecoming show at Pensacola Naval Air Station. Spectators often audibly gasp at the maneuvers in the shows – fancy flying that brings the planes as close as 18 inches together, to altitudes as high as 15,000 feet and speeds as fast as 700 miles per hour – a velocity approaching Mach 1. An estimated 15 million spectators view the squadron during air shows each year. The highest maneuver performed in an air show is the vertical rolls performed by the Opposing Solo, up to 15,000 feet and the lowest maneuver performed in an air show is the Sneak Pass, performed by the Lead Solo at 50 feet. The fastest speed flown during an air show is about 700 mph (just under Mach 1; Sneak Pass) and the slowest is about 120 mph (Section High Alpha). The basic acquisition price of a single F/A-18 Hornet is approximately $21 million. The F/A-18 can reach speeds just under Mach 2, almost twice the speed of sound or about 1,400 mph. An F/A-18 weighs about 24,500 pounds empty of all ordnance and aircrew. The trail of smoke left by each aircraft is produced by pumping biodegradable, paraffin-based oil directly into the exhaust nozzles of the aircraft where the oil is instantly vaporized into smoke. It provides an obvious path for spectators to follow and enhances the safety of flight by providing a means by which solo pilots can see each other during opposing maneuvers. It poses no hazard to the environment.